We have thousands of properties for sale all over France. But we've no property for sale in Argenton sur Creuse at the moment. And that's something we want to change. If you have a property to sell in Argenton sur Creuse (or nearby) then act now to get a 50% discount. Just place your advert in the normal way (Click here to place your advert). Then send us an email quoting "Argenton sur Creuse" and telling us that you you saw this offer. Argenton sur Creuse is a small, friendly town in the south of the Centre-Val-de-Loire. Some have compared this adorable rural town to Italy's Venice, due its picturesque placement along the banks of the River Creuse. Although for others, Argenton sur Creuse is far cleaner and more beautiful than Venice. 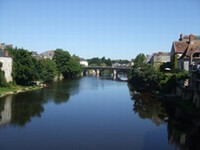 A large amount of renovation work has also made Argenton sur Creuse a desirable place to live, with quite a few English moving into the area. Its winding cobbled lanes around its thriving marketplace make this town livelier than many expect from the heart of rural France. Its Thursday and Saturday markets are not to be missed, though get up early as much will have gone by midday! Meanwhile the town's old mediaeval houses have been well preserved, providing much to look at while exploring the town's streets. Argenton sur Creuse has a plentiful supply of restaurants, cafés and bars. 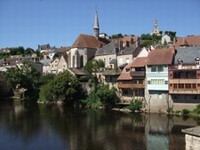 Daily guided tours of the town are available, or you may prefer to wander and discover Argenton sur Creuse on your own. In the 19th Century the town was a major producer of shirts, this important clothes industry now recognised in the Musée de la Chemiserie et de l'élégance masculine. For those wanting to exert a bit more energy, Argenton sur Creuse also has a large swimming pool with slides to enjoy. As Argenton sur Creuse is surrounded by green hills it's a perfect place to take a relaxing break or a satisfying retirement. The area is great for those who enjoy outdoor pursuits. Argentomagnus is close by, which is an archaeological site dating back to the Roman times. The nearest airport is in Poitiers, which operates direct flights from the UK with Ryanair. Limoges Airport is not too far away either, so there is plenty of scope for those looking for the cheapest flights. Limoges is served by Ryanair and flybe. Alternatively, you could travel by train on the country's fast and efficient TGV service which links to both Poitiers and Limoges. Although property in the region can be incredibly cheap, Argenton sur Creuse has experienced an increase in property prices over the last few years. Townhouses can quite often be as much as 500,000 Euros and more, although it must be said that bargains can still be found. These images were very kindly sent in by Stephen Hopkins. A big thank you to him, for thinking of us and helping us to improve our property guide! Do you know Argenton sur Creuse better than we do? Do you have photos of Argenton sur Creuse? WHERE IS Argenton sur Creuse? In the south of the Indre department. Access: Nearby Poitiers has both an airport and a TGV station. Economy: Has always been a lively market town. Interesting fact: Has a "Venetian" appearance due to its placement along the River Creuse.